One of the most popular videos on my website is the 'Three Dishes' video about three new Frantzén/Lindeberg dishes, created after the refurbishment of the restaurant in the summer of 2012. 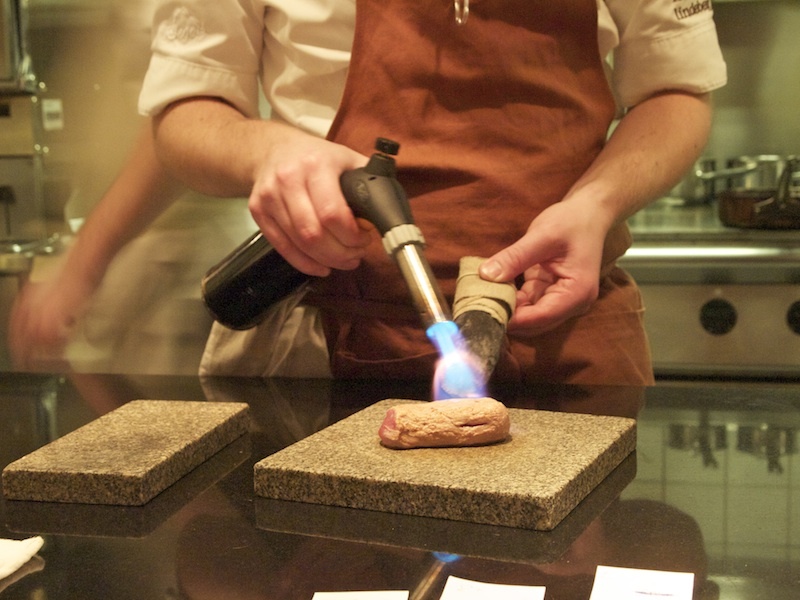 Scandinavian food is hot and restaurant Frantzén/Lindeberg in Stockholm is even hotter. It belongs to executive chef Bjorn Frantzén and his business partner and pastry chef Daniel Lindeberg. The duo met in the late 90s at the then two-star Edsbacka Krog restaurant in Stockholm. After roving throughsome of France's and the UK's top kitchens, Bjorn and Daniel opened their eponymous restaurant in Gamla Stan, the old town of Stockholm, in 2008. 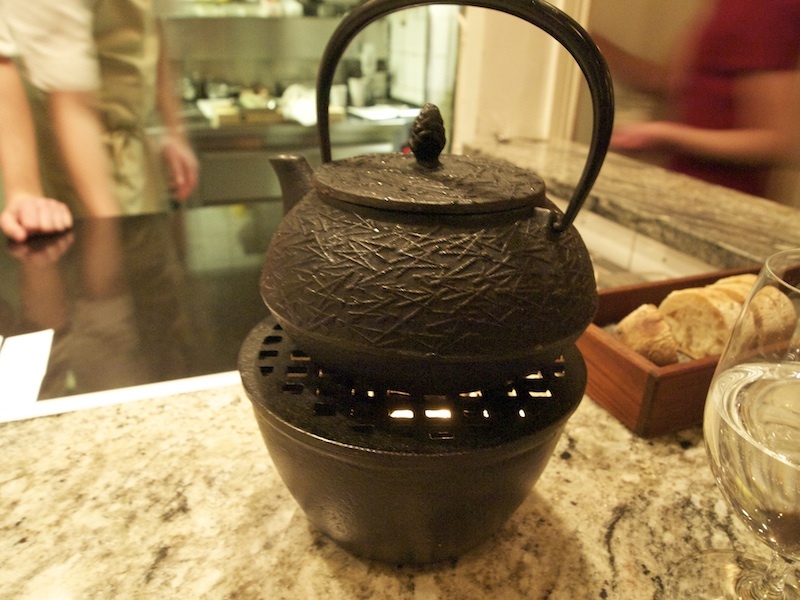 A year later the restaurant was awarded its first Michelin star. 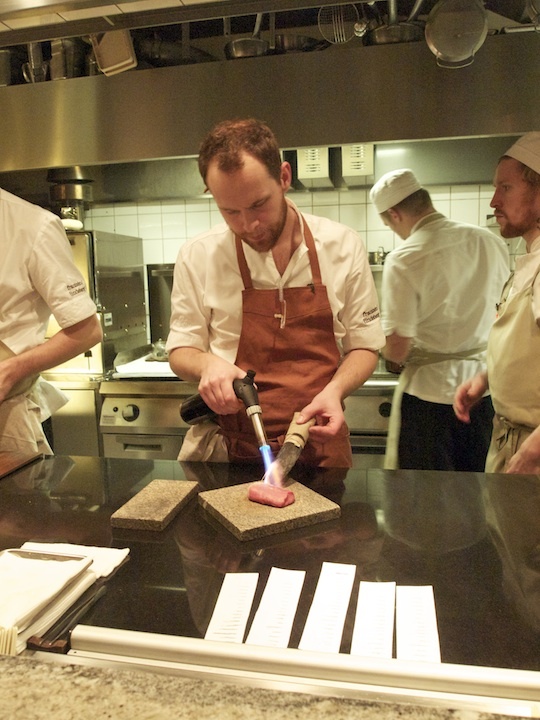 A second star followed in 2010 and in 2012 Frantzén/Lindeberg entered the World's 50 Best restaurants list at number 20. The 2012 refurbishment created extra kitchen space at the expense of the number of covers; the latter has gone down from 25 to 18 (14 in the dining room and 4 at the kitchen counter). On the other hand the kitchen now holds a langoustine tank, a meat aging fridge, a rotisserie and the patisserie section has been extended; the number of chefs working in the kitchen has gone up from 8 to 12. A ratio of two chefs to every three diners is in itself an indication of a healthy level of ambition! Frantzén/Lindeberg is open for dinner Tuesday till Saturday; on Saturday they are open for lunch too. For dinner the restaurants offersa 17-course set menu (2,100 SEK = €243.44) for all guests both in the restaurant and at the kitchen counter and on Saturday there's a 14-course set lunch menu (SEK 1,650). Lack of space precludes the restaurant from having a wine cellar and a wine list and consequently the wine pairing (1,400 SEK = € 162.29) is the only realistic option. I had dinner with my husband at the kitchen counter on Saturday 1 December 2012. Sitting at the counter has the added bonus that Björn Frantzén is always at hand to give explanations about the not always simple dishes; food with subtitles! 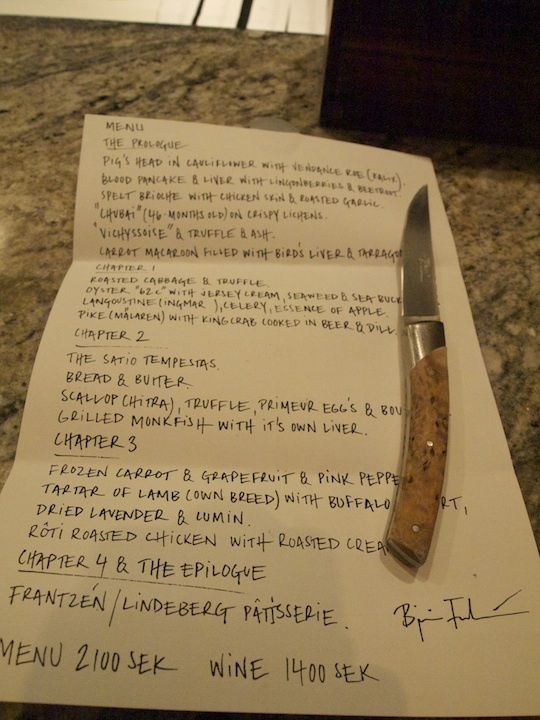 The menu at Frantzén/Lindeberg is divided into 'The Prologue', 'Chapter 1', 'Chapter 2', 'Chapter 3', 'Chapter 4' and 'The Epilogue'. Pig's head, crackling, Vendace roe (from North Sweden, Kalix), green apple, samphire. Crisp pork crackling served with a spoonful of lovely soft pig's head, a dollop of Vendace roe, finely chopped apples and samphire. Lovely fatty pork flavours and nice crunch and freshness from the apple. Both the roe and the samphire provided a lovely elegant salty finish. Blood pancake, foie gras, lingonberries, beetroot and potato crisps. Wonderful soft pancake with good, dark blood flavours. On top of the pancake was a piece of foie gras that was nice and caramelised. Great textures, first the soft pancake, followed by the tender foie gras and finally the crunchy potato crisps. Also loved the bitter-sweet flavours of the lingonberry puree. Spelt brioche, chicken skin, roasted garlic. A perfect, rectangular piece of spelt brioche spread thinly with roasted garlic and crispy chicken skin. Fantastic, flavoursome brioche and the roast garlic was wonderful. Great length too. 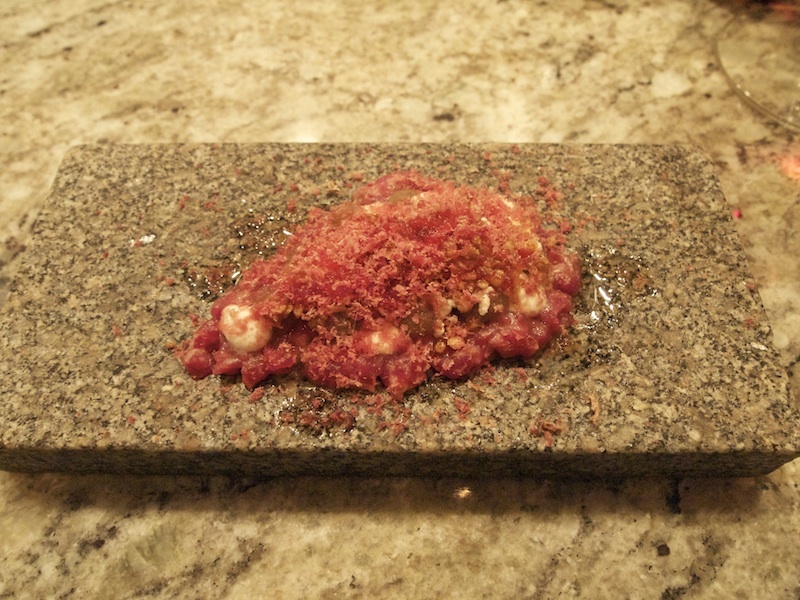 Beef tartare (from 46-month old animals of the 'Chubai' breed), crispy lichens. Wonderfully brittle lichens with lovely tender and delicately flavoured beef and some grated foie gras on top, which provided a nice and smooth finish. 'Vichyssoise', truffle and ash. Perfect deep-fried crisp potato strips and soft leek topped with delicious earthy and fragrant Swedish (Gotland) truffle. Carrot macaron, liver and tarragon. A perfectly made, virtually weightless carrot and liver macaron. Lovely touch of aniseed from the tarragon. 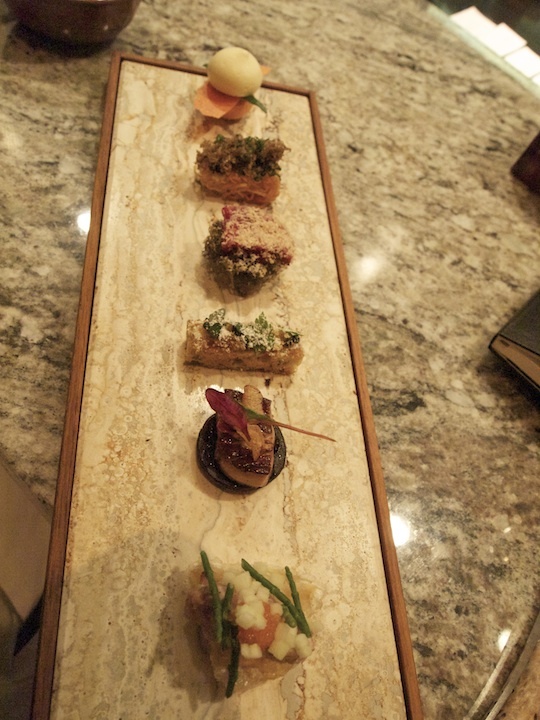 Six complex amuses bouches made with great precision and attention to textures and flavour. Time for 'Chapter 1' (four courses). First course. 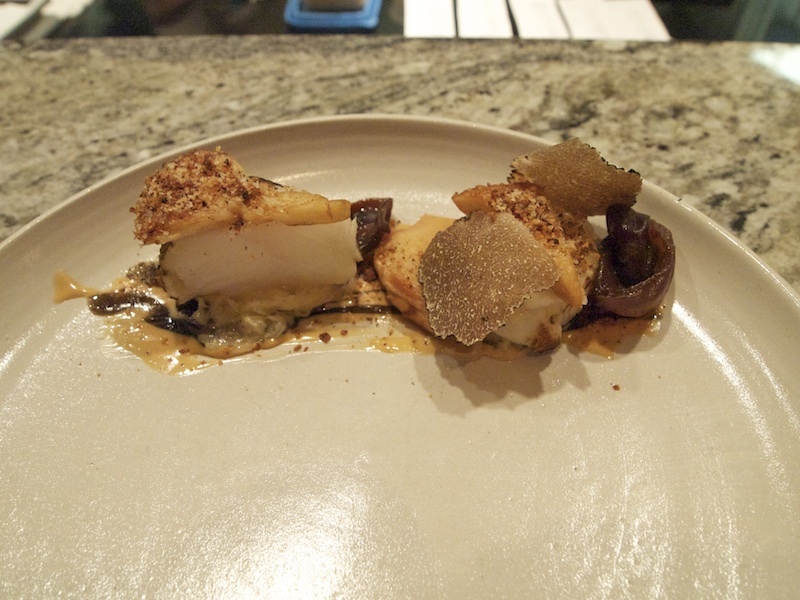 Roasted cabbage and truffle. An immaculate, clear and fragrant stock made from roasted cabbage that had an incredible depth of flavour. I checked with Björn Frantzén whether the stock was really only made with cabbage and he confirmed it was; just roasted cabbage and a touch of lemon to bring out the flavours. He said that any other addition, like veal or beef stock, would compromise the purity of the flavour. 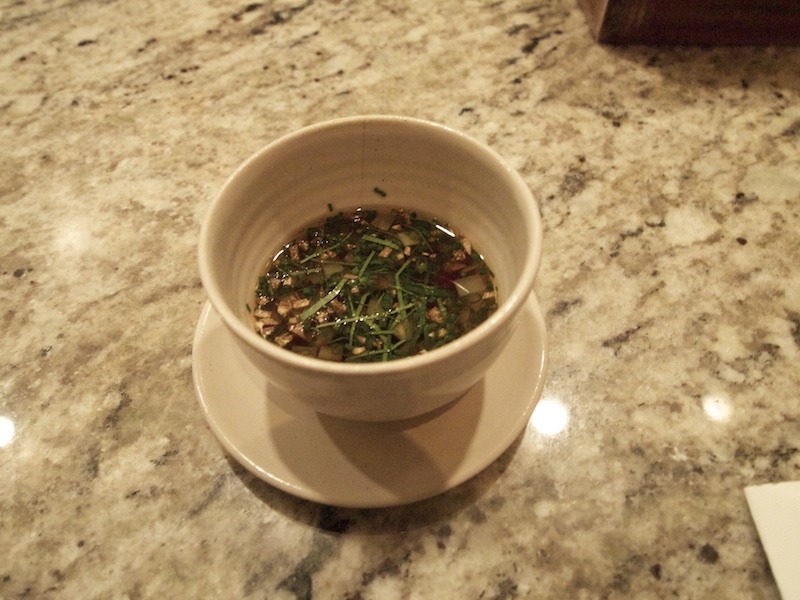 And he was right; this stock didn't need any other ingredient. In the stock were some small pieces of crunchy cabbage and truffle and some finely chopped chives. Pure and perfect. Second course. 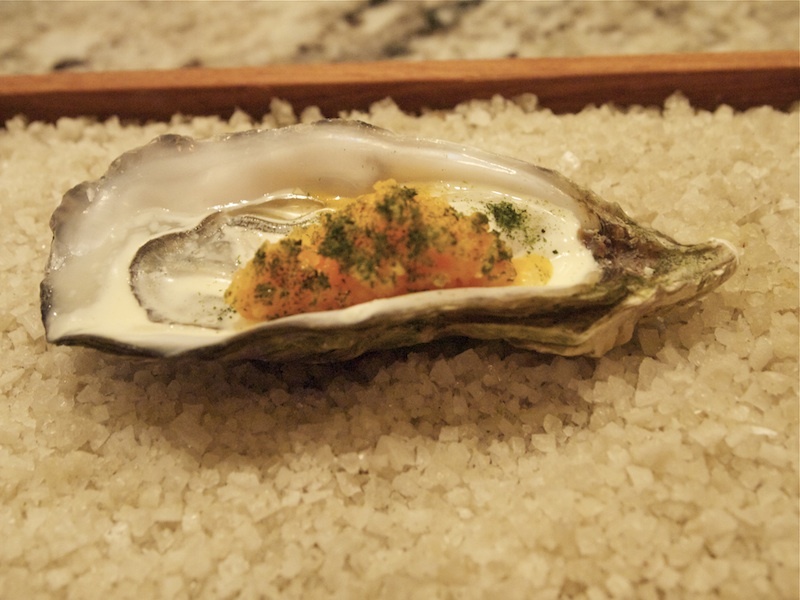 Oyster 62°C, Jersey cream, seaweed and sea buckthorn. 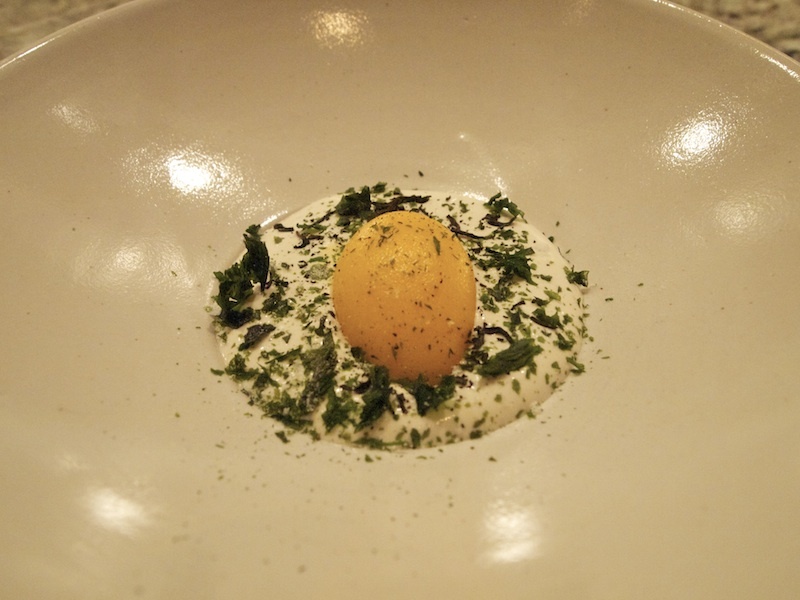 A delicious juicy and meltingly soft oyster (poached in the shell at 62°C) served with a sea buckthorn sorbet, a few drops of walnut oil and some seaweed powder. All wonderfully pure flavours and the sea buckthorn really enhanced the salty oyster flavour. Loved the touch of comfort from the walnut oil and the sea weed powder added a wonderful intensity. Third course. Langoustine (supplied by Ingmar Johansson, boat Myra 137), lard, celery, Swedish caviar, apple essence, rapeseed oil. Fresh langoustine tartare - really fresh. 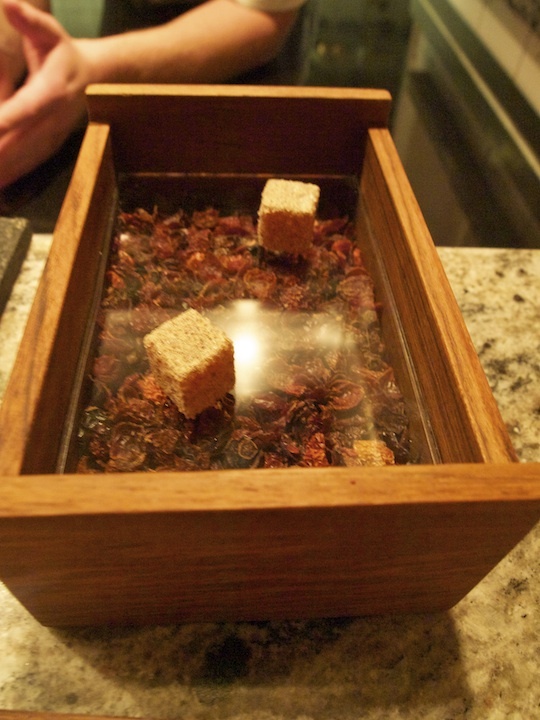 The langoustine is taken from the langoustine tank in the restaurant minutes before serving. The tartare is covered with a thin slice of melting lard, a fresh celery cream mixed with Swedish caviar, topped with a foamy apple essence and finished with a drizzle of 'final pressing' rapeseed oil. The langoustine tartare was beautifully delicate, the very pure and intense apple essence (6,500 kilos of apples yield one liter of essence) enhanced the natural sweetness of the langoustine. An extraordinary dish with fantastic, fresh and vigorous flavours. The langoustine and apple reached a perfect synergy. Last and fourth course. 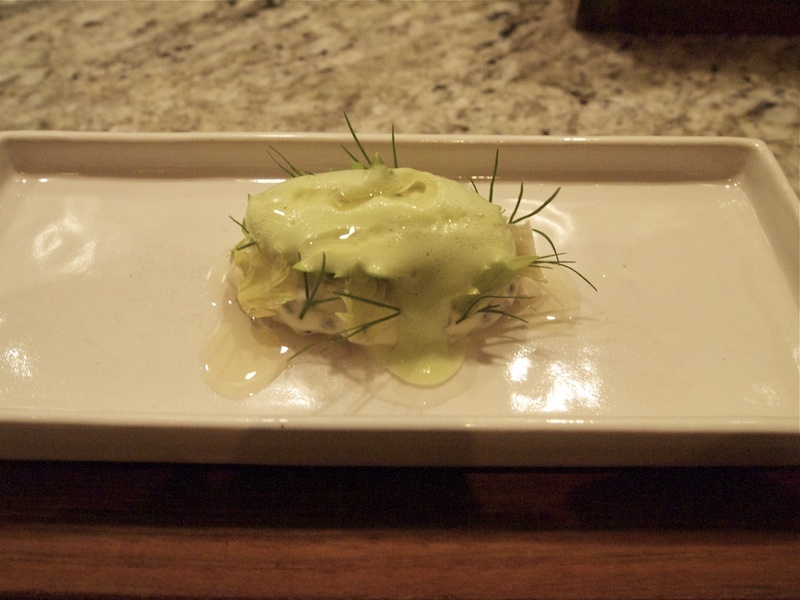 Pike (from lake Mälaren), king crab, beer and dill. A wonderfully silky velouté with top-quality freshly picked king crab meat, cubes of creamy pike mousse, almonds, beer and garnished with some pure and concentrated dill juice. A stunning dish with fantastic creamy and luxurious flavours, the beer delivering the perfect touch of bitterness and the almonds adding texture and contrast. 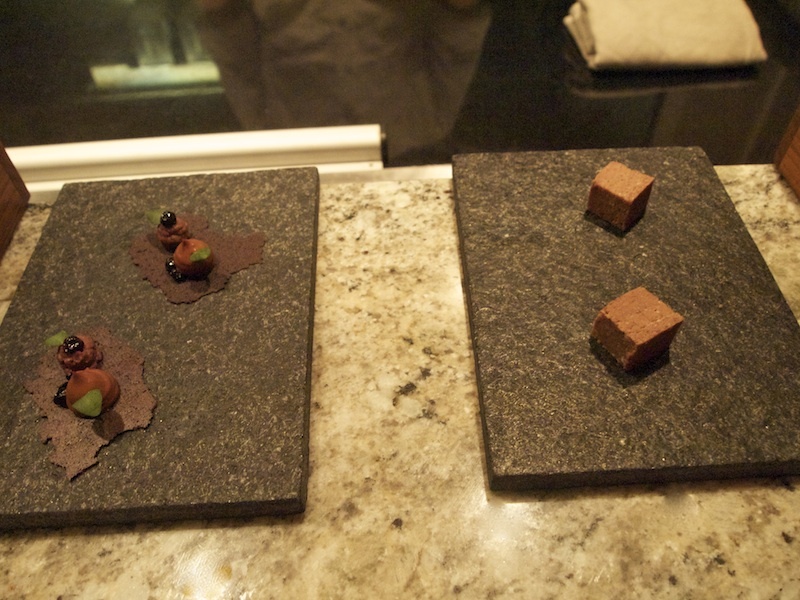 Next was 'Chapter 2' (four courses). First up was The Satio Tempestas (flavours of the season). This vegetable dish is the only one to have been on the menu at Frantzén/Lindeberg since the inception of the restaurant and the only one to change daily. The dish is composed with no fewer than 39 seasonal ingredients all grown by long-time supplier Lars Feddeck in his biodynamic garden in Askersund. As many as 18 different cooking techniques are involved to create this work of art. Every diner is presented with a list of ingredients before the dish is served. On 1 December 2012 some of the ingredients were: parsnip, cauliflower, potato, kale, purple and yellow carrot, red onion, parsley root, salsify and beetroot. A terrific selection of vegetables with great textures and flavours such as crisp, sweet, soft, baked, smooth, bitter, fresh, salty, pickled and dried. Nothing has been omitted to get the maximum potential out of the vegetables. Also on the plate was some red onion salt which really brought out the flavour of all the vegetables and elevated the dish. 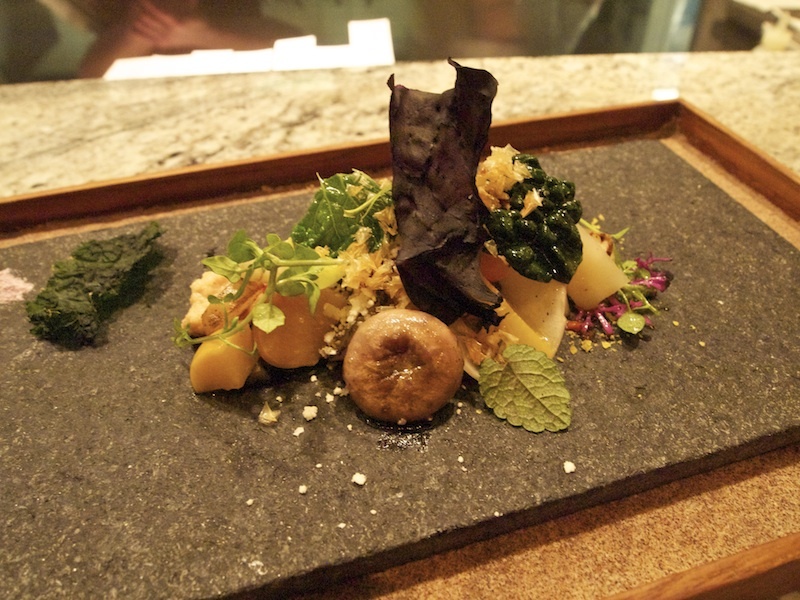 A beautifully presented dish that showcased an astounding level of skill, complexity and attention to detail. 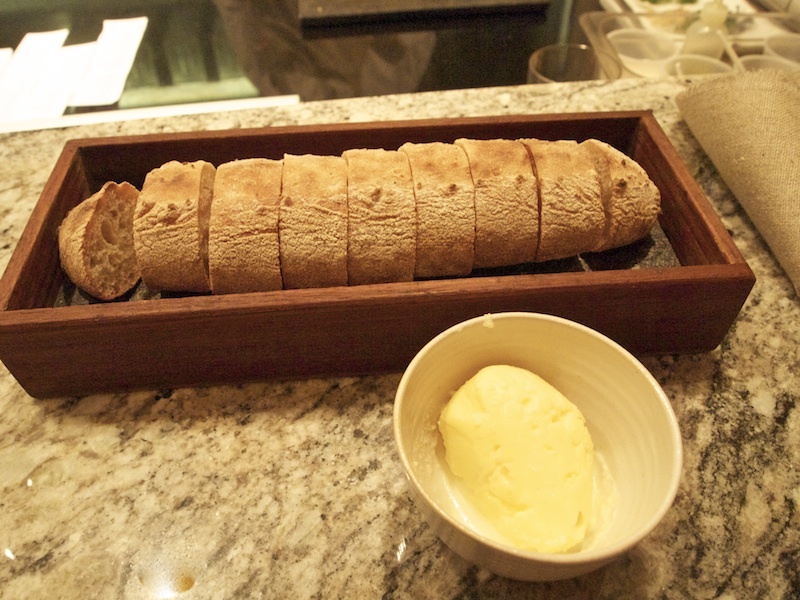 Bread and butter is a serious affair at Frantzén/Lindeberg. At the beginning of the meal the dough (made with a Poolish starter) is already on the table in a wooden box with a see-through lid. During the Prologue and Chapter 1, the dough stays on the table to prove. After this final stage of dough-rising the bread is baked in a Josper oven and served with freshly churned butter made with Jersey cream and salt. The bread was superb, with a beautiful, moist texture and a fantastic crust. Third course. 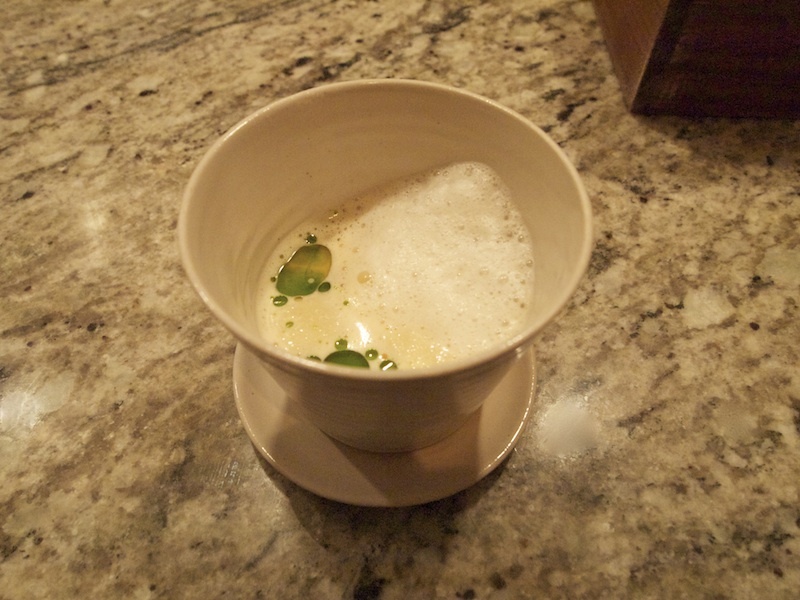 Scallop, truffle, primeur egg and dashi stock. First a wonderfully tender scallop served in the shell with truffle (Tasmanian) puree, freshly grated truffle, beurre noisette, a few drops of yuzu and topped with a divine primeur egg (a hen's first egg) emulsion. Loved the build-up of flavours in this dish: first the sweet and earthy flavours of the scallops and the truffle, followed by the intensity of the beurre noisette and the yuzu and finally the gorgeous creamy finish from the egg. 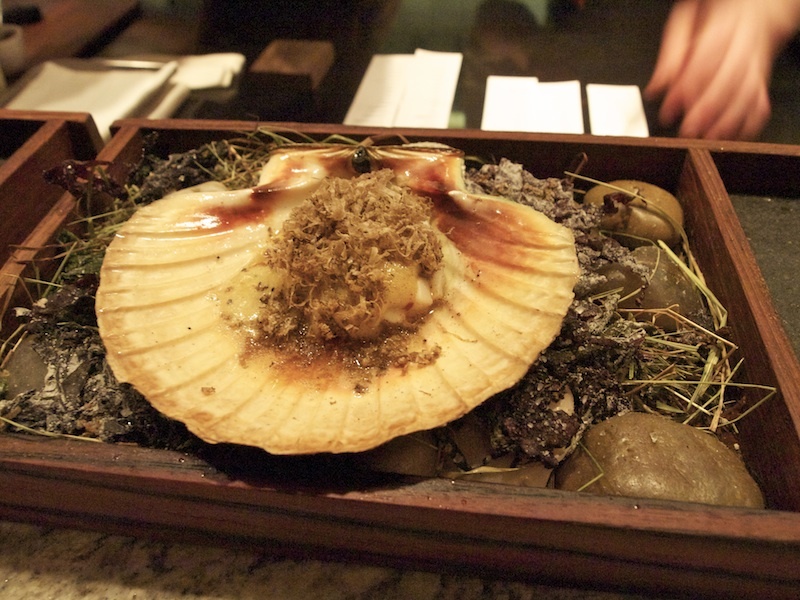 The scallop was cooked in the shell and therefore delivered a wonderfully intense flavour sensation. Next came a quenelle of sweet and creamy scallop tartare. The tartare was bound together with roe and had the the perfect touch of lime and soy. Finally a teapot filled with stock arrived. 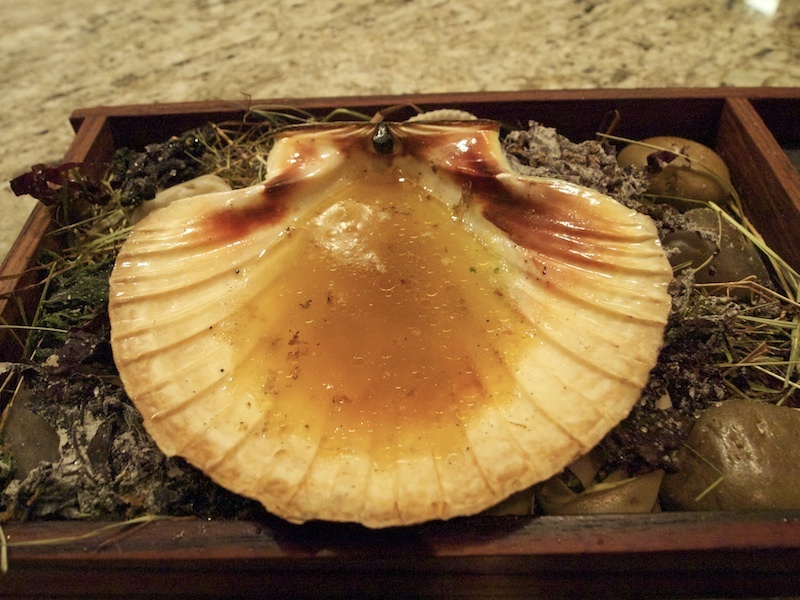 The stock was made from dried scallops, yellow chanterelles, seaweed and dashi and was intended to be poured into the scallop shell, so you could drink all the juices of the scallop combined with this beautifully delicate stock which was light but intense at the same time. Very clever and creative dish(es). Fourth course. Monkfish, mushrooms, lard, monkfish liver, rapeseed oil, onion. Absolutely superb, slow-cooked monkfish which had a tender but still firm texture. Perfect. The monkfish was covered with a thin layer of lard and was served with a wonderful rich sauce made from monkfish liver and rapeseed oil. Also on the plate were some delicious braised onions, a few truffle shavings and mushrooms topped with crispy and buttery breadcrumbs. Next some smoked brown butter and fresh butter with ash arrived to go with an extra serving of the gorgeous bread. All set for 'Chapter 3' (3 courses). First course. Carrot, grapefruit, olive oil, birch tree oil and pink peppercorns. A perfectly smooth carrot and grapefruit sorbet, possibly the smoothest sorbet I have ever had. Lovely sweet and bitter flavours, the grapefruit adding the perfect zing. All these wonderful flavours were intensified by the pink peppercorns. I loved both the oils, they added fragrance and delivered a lovely finish. Second course. Lamb tartare (own breed), lamb jus, buffalo yoghurt, goat's feta cheese, aubergine, dried lamb brisket, dried lavender and cumin. Earlier this evening Björn Frantzén seared the lamb used for the lamb tartare with Japanese charcoal (see first 2 photographs). The lamb tartare was absolutely sublime, soft, tender and very flavoursome. An exquisite dish with very detailed flavours; first the delicate lamb tartare, intensified by the lamb jus, then a layer of well-balanced North African flavours, the soft aubergine, the warm and fragrant cumin, the salty feta and finally the lamb brisket to add an extra dimension to the lamb tartare. So light, so elegant, brilliant! Third course. 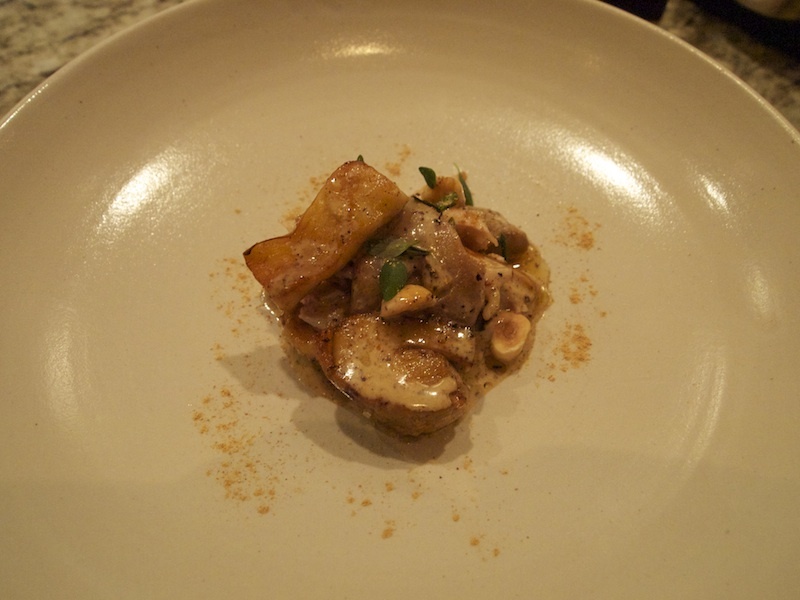 Roti roasted chicken, roasted cream, cockscomb, Jerusalem artichoke, fermented beans, yellow chanterelles, toasted hazelnuts, cep powder. Beautifully moist and tender chicken served with a delicious rich and bold sauce. 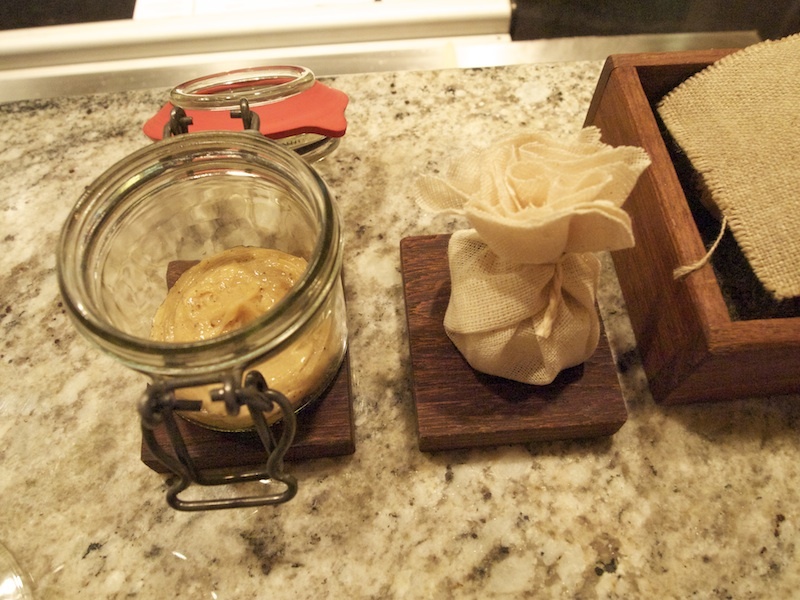 Lovely silky smooth Jerusalem artichoke puree. Nice, meaty chanterelles and the cep powder was fantastic and added a wonderful depth of flavour to the dish. Great crunch and flavour from the toasted hazelnuts. A wonderful chicken dish with a lovely buttery finish. Right! Time for 'Chapter 4' (1 pre-dessert and 2 desserts). First the pre-dessert: Oxidized pear granita, hazelnut, sea salt and flat 'Braggot Mead'. 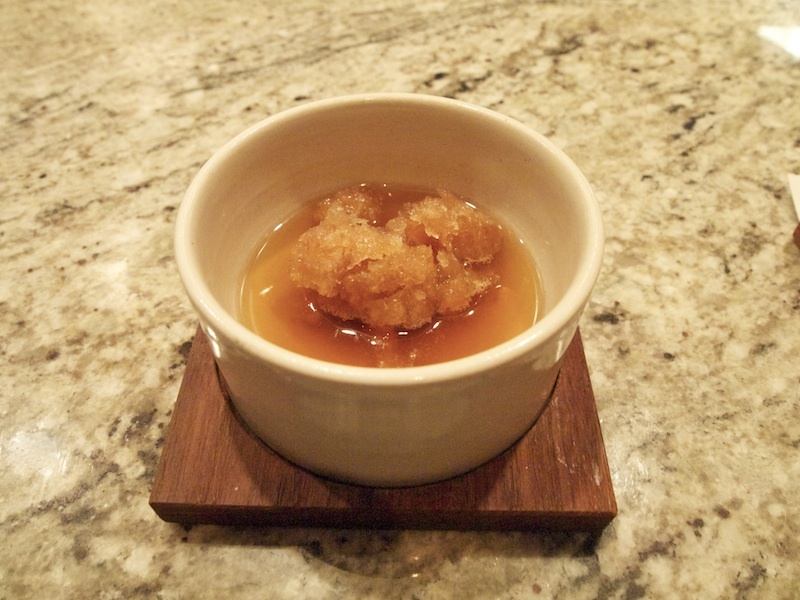 Delicious fresh and intense pear granita and a lovely concentrated hazelnut paste. Subtle malty flavours from the Braggot Mead. A fresh and vibrant pre-dessert. Next was Roti roasted Hokkaido pumpkin, muesli, truffle honey, pumpkin seed oil and truffle ice cream. 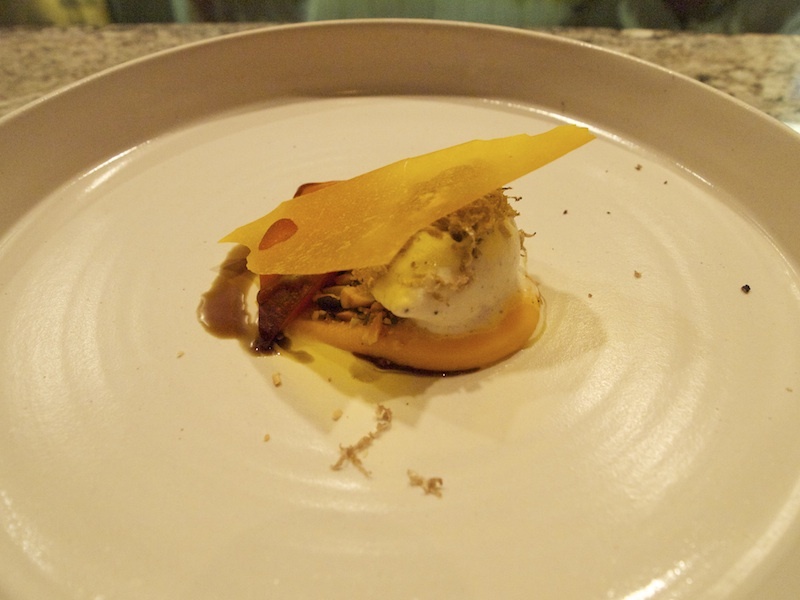 Great pumpkin textures and flavour-intensities: wonderfully savoury-sweet roasted pumpkin, creamy pumpkin puree, dark and concentrated pumpkin seed oil and a lovely pumpkin crisp. Loved the roasted pumpkin, the intensity of the flavour was terrific. 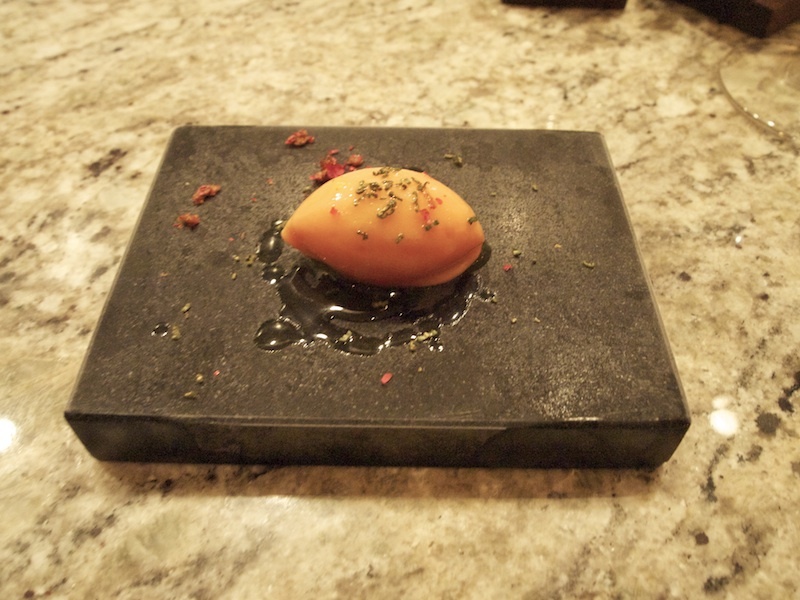 Lovely fresh and light truffle ice cream which combined beautifully with the sweet and earthy pumpkin flavours. Great crunch from the delicious muesli made with nuts, almonds, pumpkin seeds and brioche crumbs. A terrific savoury dessert with a perfect balance between sweet and salty flavours, a thing of great beauty. Final dessert. Sea buckthorn sorbet, Oolong mousse, Matcha tea meringues, crystallised sea lettuce. A fantastic sweet and tart sea buckthorn sorbet, again perfectly smooth, served on some delicious crunchy green tea meringues a wonderfully fluffy and creamy Oolong mousse. Nice crunch and marine flavours from the crystallised lettuce. A lovely, refreshing dessert with great textures. 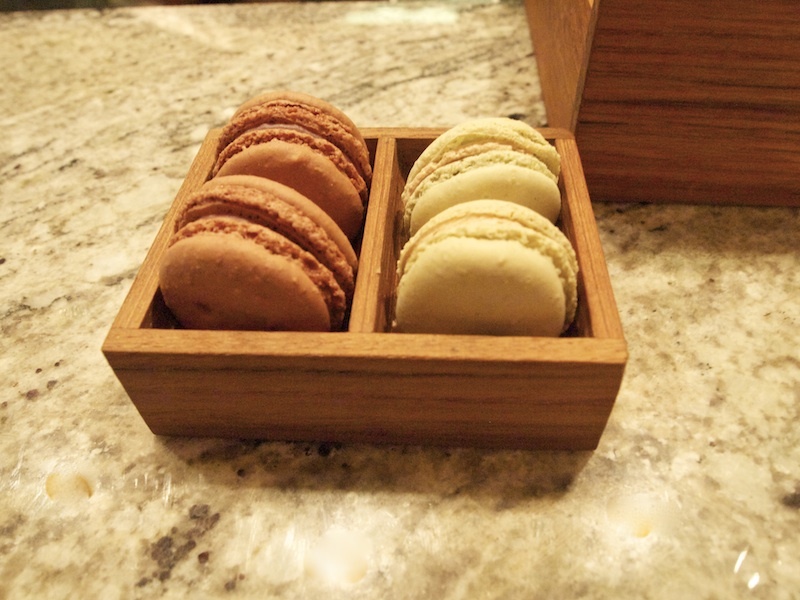 And finally 'The Epilogue', a great selection of sweets and other sweet and savoury delicacies: Green tea macaron with a hazelnut filling, Chocolate macaron with a artic raspberry filling, Fermented garlic toffees (delicious!! 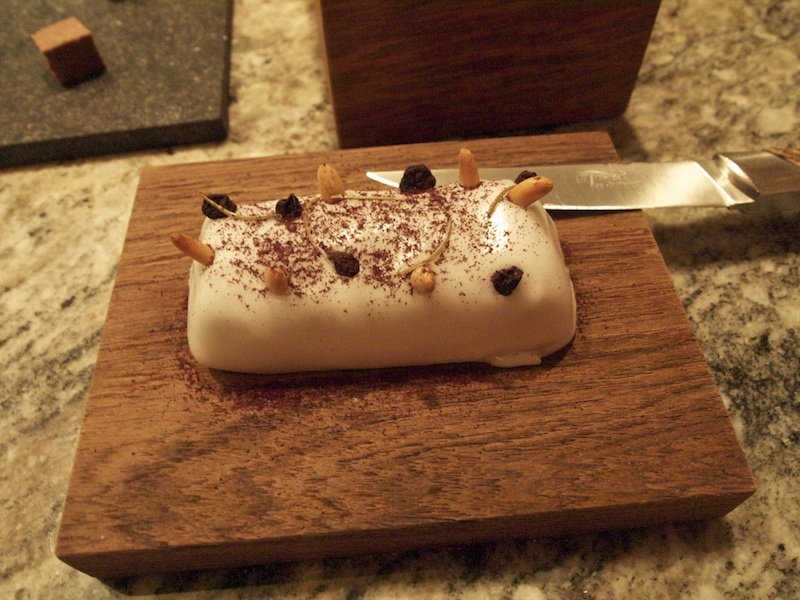 ), Dried pig's blood crackers with pig's blood cream, pickled elderflower berries and bitter chocolate, Walnut turron, Rosehip marmalade with cream and a Fondant glazed blueberry cake with pine nuts, bark and pickled spruce shoots. 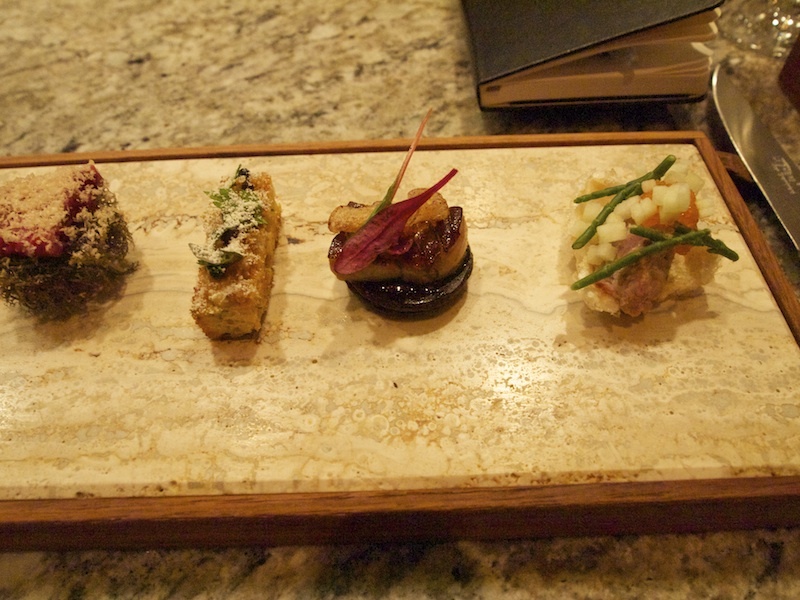 This kitchen counter meal at Frantzén/Lindeberg was a dazzling experience. A brilliant display of inspiration and skill, organisation and dedication. Exceptionally detailed cooking results in dishes that are minimalistic in style but complex in composition and that all have absolutely sublime and pure flavours. The quality of the ingredients is second to none, also as a result of a fantastic interaction with the restaurant's suppliers. The suppliers are challenged to deliver the best possible produce to the restaurant and Björn Frantzén is challenged to create dishes which will do justice to these ingredients and elevate them to truly great food. Is this Nordic cuisine, you ask? Yes it is. Frantzén/Lindeberg is in perfect harmony with is surroundings, its terroir if you will. The flavours are clean and precise, the style is cool and collected, sustainability is important. Is this New Nordic Cuisine? No, not in the dogmatic sense of the word. 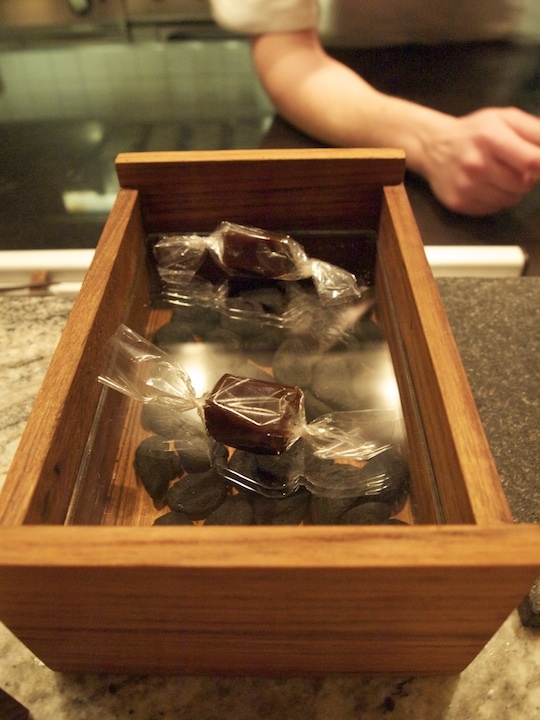 For Björn Frantzén there is only one guiding principle: flavour. 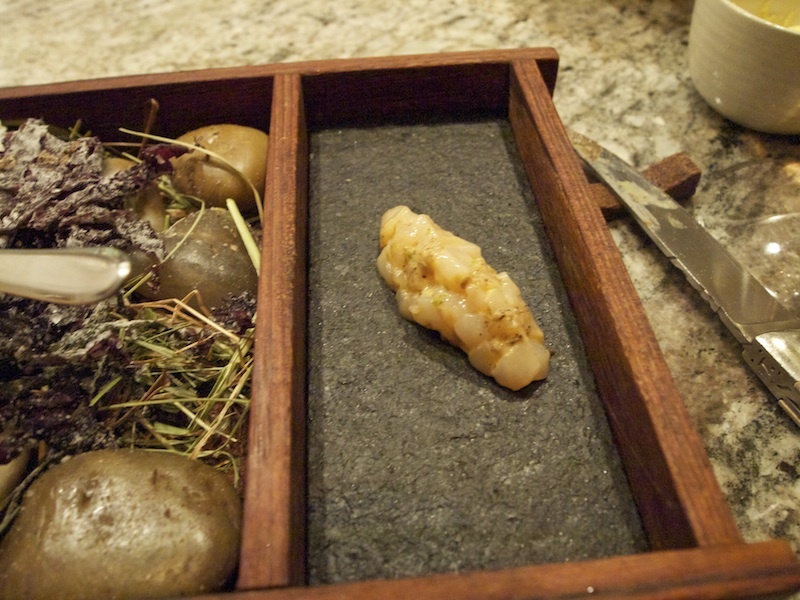 Gastronomy at the highest level nowadays is a set of (near-)paradoxes. We look for food that is flavoursome yet elegant, local yet eclectic, refined yet uncluttered, individualistic yet harmonious, modern yet classically based, complex yet approachable, exciting yet relaxed, innovative yet comforting. It is almost too much to ask. But Frantzén/Lindeberg delivers on all fronts. What stayed with me most was the absolute calm and virtuosity with which the food was prepared in front of our eyes, from the first amuse bouche until the very last fermented garlic toffee-bite, as if nothing could be simpler than this.